More than 100 years after the creation of the Alaska Native Brotherhood, a new bridge in Juneau has been named in honor of the Native organization. But it’s not the first. The predecessor to the current bridge was actually designed by a man who has his own unique and interesting ties to the Alaska Native civil rights movement. 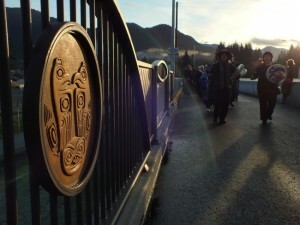 On a bright morning recently in Juneau, local politicians, bureaucrats, contractors, and Native leaders dedicated the new $25-million Brotherhood Bridge. “We are absolutely blessed to have such a beautiful morning to celebrate the opening of this bridge and the cutting of the ribbon,” says Marc Luiken, Commissioner of Alaska Department of Transportation and Public Facilities. The new bridge crosses the Mendenhall River about four miles downstream of the Mendenhall Glacier. It’s twice the width of the original Brotherhood Bridge constructed in 1965 and named in honor of the Alaska Native Brotherhood. That’s the Alaska Native civil rights advocacy organization created in 1912. The designer of the original bridge was Roy Peratrovich, Jr., whose family settled in Klawock and Juneau for a time before moving down south. Peratrovich says he never intended to design bridges. He just sort of fell into the profession. Peratrovich says he was newly married and needed a job after graduating from the University of Washington in 1957. He was hired by the City of Seattle largely because he got an ‘A’ in a bridge design class. Shortly after statehood, Peratrovich returned to Alaska as the first Native to be registered as a professional civil engineer. 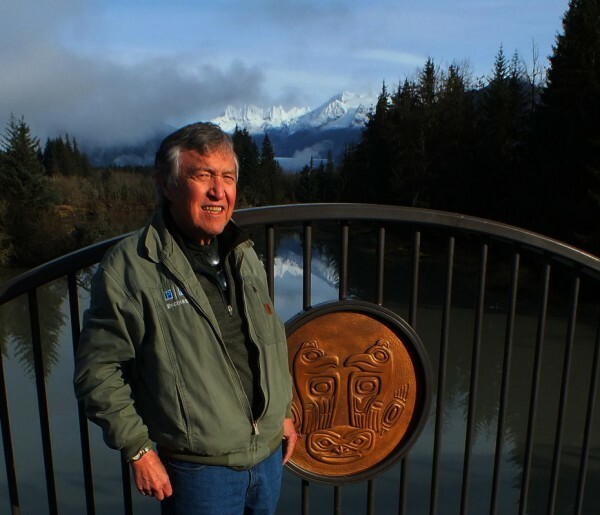 He remembers telling his boss, chief bridge engineer Charlie Smith, about his Tlingit background when he started designing the Mendenhall River crossing. That was during the 50th anniversary of the ANB. It would be known as Brotherhood Bridge, and 10 large bronze medallions commemorating ANB would be installed in the bridge’s pedestrian railing. Peratrovich says the project allowed him to incorporate his first love, art, into his profession. He found his inspiration in a small medallion that he borrowed. “Kind of a dollar, a bronze dollar that was made with that medallion picture on it, only a lot cruder,” Peratrovich says. He redid the design with the shapes and other form-lines seen in Northwest Coast art. Tlingit moieties Eagle and Raven face each other, and both are standing upon a rock that represents ANB. A colleague carved the design into a large plank of yellow cedar which became the master for the bronze castings. After the Brotherhood Bridge opened in 1965, Lt. Gov. Byron Mallott says he made a particular effort to see it because of what it meant to Alaska Natives, and all Alaskans. The bronze medallions were saved when the old bridge was recently dismantled. 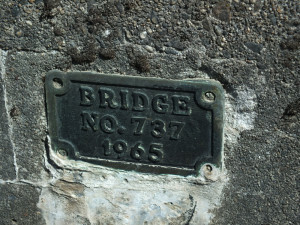 They were then restored and installed on the railing of the new bridge. But that isn’t the only connection that Peratrovich has to the Alaska Native civil rights movement. You may think that name is familiar. You see, I failed to mention he was the son of Roy Peratrovich, Sr., and Elizabeth Peratrovich. Yeah, that Elizabeth Peratrovich — The president of the Alaska Native Sisterhood who schooled clueless lawmakers in the Territorial Senate on the segregation, discrimination and prejudice faced by Alaska Natives. After leaving state service, Roy Peratrovich, Jr., and a friend created a consulting and design firm that later become Peratrovich, Nottingham and Drage, or PN&D. Now 81 years old, Peratrovich creates art in his studio in Gig Harbor, Wash. His 10-foot bronze sculpture, “Flight of the Raven,” located at Fourth and E Streets in Anchorage, was created to honor his parents and tells the story of how Raven brought light to the world.